Person on duty was unaware of our reservation. I had to show him the email receipt from Dockwa. We were given poor directions to a slip. We docked in what was a derelict slip by mistake, with the directions given. One of my crew put her foot through the rotted wood on the dock. Someone finally showed up to guide us to the correct area. The bathroom and, I assume,shower (we never saw either), were closed at night, until 10 am. 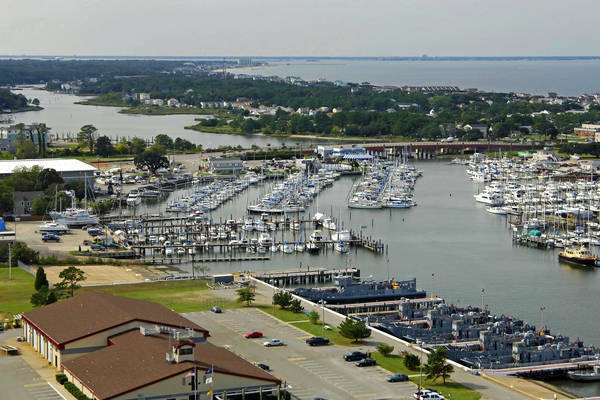 Vinings Landing Marina offer slips for both sail and power boats as well as dry storage for smaller vessels With a knowledgeable and friendly staff and plenty of amenities, we hope your stay with us will be comfortable, convenient and enjoyable. We offer transient dockage year round at Vinings Landing Marine Center. Dockage is available for vessels up to 48 ft. with 30 amp, 50 amp or twin 30 amp power in select locations. 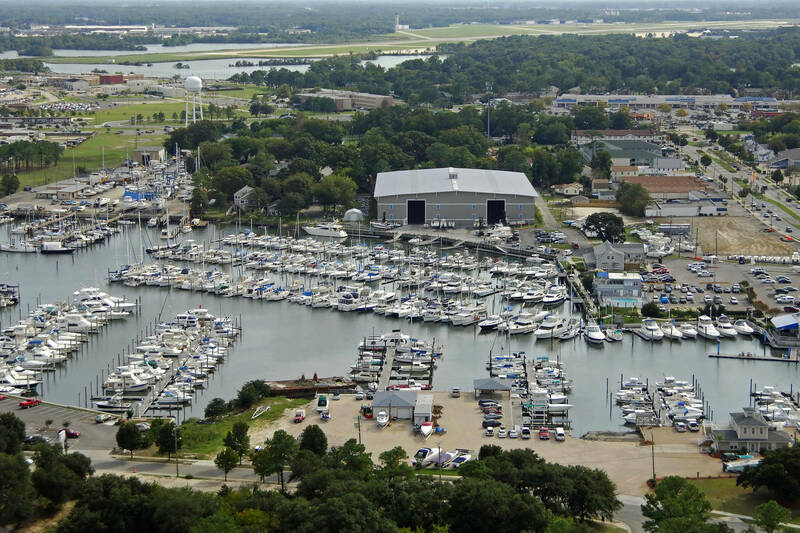 We do allow transients for a few nights, but DO NOT allow liveaboards living at the marina for extended amounts of time. From the Atlantic Ocean Cross over the Chesapeake Bay Bridge Tunnel through the Thimble Shoal Channel. Take a port turn at either the flashing green 9 buoy or flashing green 11 buoy towards the green 1LC buoy and the red 2 buoy. Follow the channel in with the condos on your starboard side. Make a starboard turn at the point/end of the condos. Be sure not to encroach into the Navy's waters which are located beyond the string of bright orange floats. No Wake Zone begins after starboard turn with Bay Point Marina directly at starboard with Little Creek Marina directly past Bay Point. 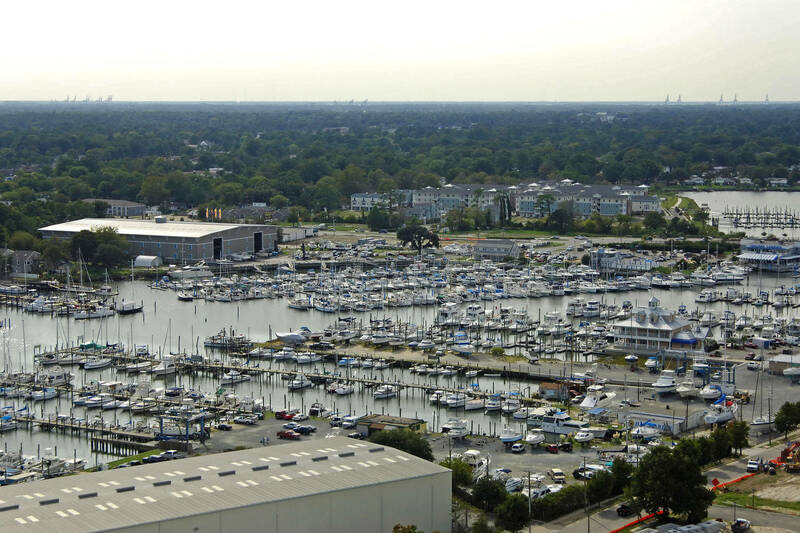 Vinings Landing is located on the port side of the channel next to the Pretty Lake Bridge. The fuel dock is located parallel to the channel next to the Sunoco sign with a side tie available if arriving after hours. From Chesapeake Bay Locate the Thimble Shoal Channel. Take a starboard turn at either the flashing green 13 buoy or flashing green 11 buoy towards the green 1LC buoy and the red 2 buoy. Follow the channel in with the condos on your starboard side. Make a starboard turn at the point/end of the condos. Be sure not to encroach into the Navy's waters which are located beyond the string of bright orange floats. 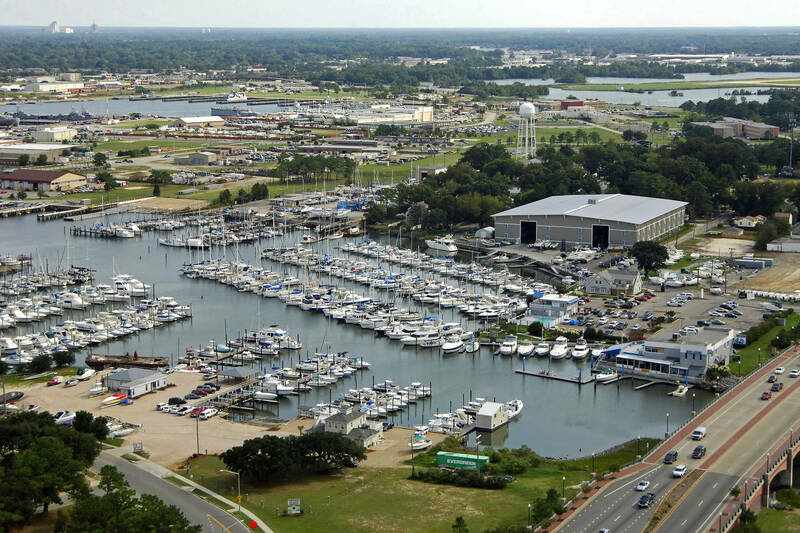 No Wake Zone begins after starboard turn with Bay Point Marina directly at starboard with Little Creek Marina directly past Bay Point. Vinings Landing is located on the port side of the channel next to the Pretty Lake Bridge. The fuel dock is located parallel to the channel next to the Sunoco sign with a side tie available if arriving after hours. 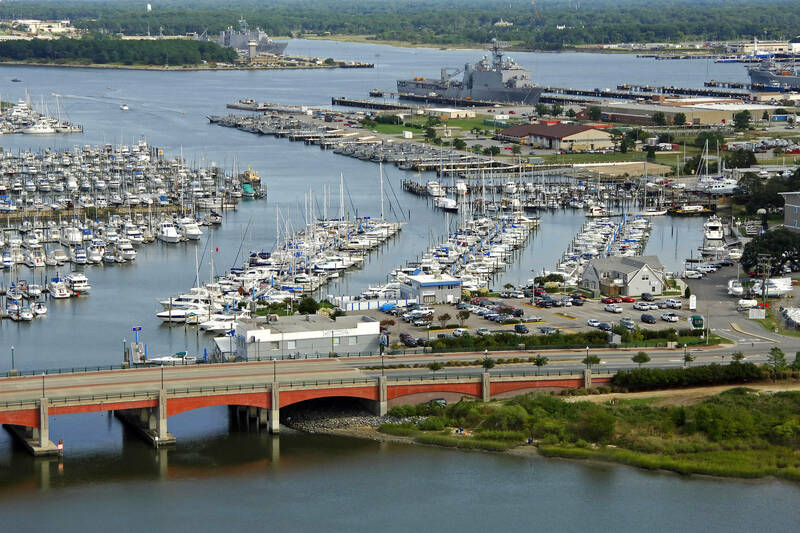 From the Intracoastal Waterway Mile Marker "0" Follow the Elizabeth River through downtown Norfolk while keeping the Navy ships to starboard. After passing the Navy docks cross over the Hampton Roads Bridge Tunnel. After the tunnel find the Thimble Shoal Channel at green 21 buoy. Take a starboard turn at either the flashing green 13 buoy or flashing green 11 buoy towards the green 1LC buoy and the red 2 buoy. Follow the channel in with the condos on your starboard side. Make a starboard turn at the point/end of the condos. Be sure not to encroach into the Navy's waters which are located beyond the string of bright orange floats. 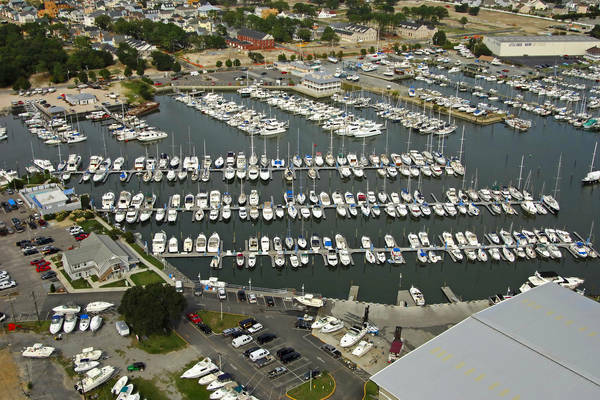 No Wake Zone begins after starboard turn with Bay Point Marina directly at starboard with Little Creek Marina directly past Bay Point. Vinings Landing is located on the port side of the channel next to the Pretty Lake Bridge. The fuel dock is located parallel to the channel next to the Sunoco sign with a side tie available if arriving after hours.